Financial District, NEW YORK -- As they look to expand alcohol sales to two locations in the Financial District, Starbucks sought support for beer and wine licenses from Community Board 1 at a meeting on Tuesday. "There's a certain amount of pretense that a person has with Starbucks that someone's not going there to get plastered," said 2 Broadway Starbucks employee Dan, who commutes in from Queens. "Maybe that will happen and they'll have to change their policy but if it doesn't work out then things can always change. It's an experiment." The coffee chain sought to garner the backing of the board's Financial District Committee to sell beer and wine at its 1 Battery Park Plaza and 55 Broad St. locations, respectively. Though community boards act as a consulting source in the process of granting alcohol licenses, the State Liquor Authority ultimately decides whether to approve or reject a proposal. However, community boards, which are made up of volunteers appointed by borough presidents in New York, may indicate an area's attitude when it comes to a certain budget proposal, policy change or another local issue. Charmaigne, a regular Starbucks customer and Manhattan resident who works in the Financial District, believes that it would take away Starbucks' "cafe vibe," which she admires. "I don't think I would feel comfortable sitting and staying with other people drinking alcohol," said Charmaigne. Starbucks encountered local resistance when it sought beer and wine licenses for its 154 N. 7th St. location in Williamsburg, Brooklyn. However, despite the pushback the company obtained a license and began serving beer and wine at the location less than one month ago as part of its "Starbucks Evenings." Over 500 people had signed a petition to discontinue alcohol sales at the chain's Williamsburg location and Community Board 1 refused its support then as well, according to ABC7. "It would become more like a European cafe, to have coffee and you can get a beer at the same time, so it will completely change the dynamic," said Chris, a Starbuck-ian Long Island resident. "You go from ... a friendly environment where your parents are comfortable taking their underage kids to Starbucks. Now they're going to have kids drinking in there and I think that probably would throw people off." On the Upper East Side, Starbucks achieved the opposite result: on Tuesday the chain appeared before Community Board 8's street life committee and won over their support for a beer and wine license at two locations. If the State Liquor Authority approves it, the "Starbucks Evening" program will be launched at the chain's 1445 First Avenue and 1542 Third Avenue locations shortly. "There's a certain amount of pretense that a person has with Starbucks that they're not going there to get plastered," said employee Dan. Dan's fellow employee Christopher, a Brooklyn native, said, "once it's implemented then there will have to be security added." In addition to its signature coffee and tea beverages, the chain features craft beer, wine and an assortment of small food plates, such as truffle macaroni and cheese, on its Starbucks Evenings menu. The alcohol is on sale from 4 p.m. to 9 p.m., when the store closes. Yet those evening hours may not be enough to convince potential customers from going to the alternative. "I'd go to a bar. Why would I go to Starbucks for a beer? It's just weird," said Chris. "I'm not going to be drinking wine or beer while I'm doing work," said Starbucks aficionado Christina, from Long Island. "Why don't you just go to the bar down the street?" In August, Starbucks added beer and wine to its menus at nearly 100 locations throughout the U.S. after testing alcohol sales since 2012 at certain stores in the Chicago area. 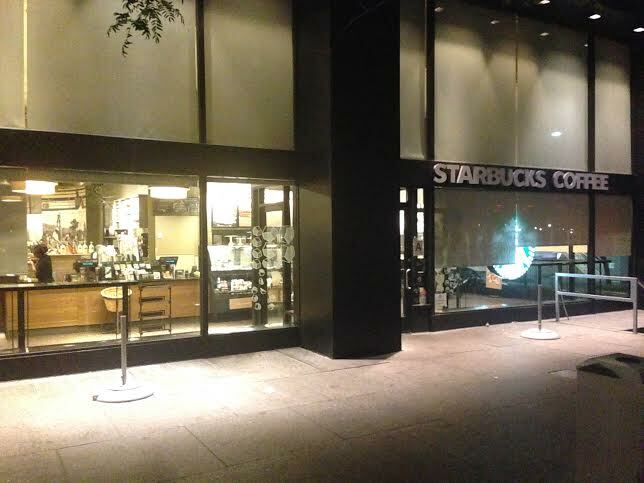 The Williamsburg location was the first in New York City to adopt the Starbucks Evenings program. "Just as each customer is unique, so are our stores and we consider a broad range of products and experiences for each neighborhood," a spokesperson from the Starbucks Media Relations Team said in an email. "We’re in the very early stages of considering the Financial District for the evenings menu. It’s a long and thoughtful process and the permit filing is just one of many steps we take." She said that Starbucks did not have any additional details to share at this time.